Abies colimensis, first described by K.D. Rushforth (born 1953) and Hector Narave Flores in 1989 is commonly known as Colima fir or as Abeto de Colima in the Spanish language. While visiting the Nevada de Colima during a joint expedition to northeastern and western Mexico, Rushforth collected and studies specimens of Abies that were growing there that were previously recorded as Sacred fir (A. religiosa) based only on the study of sterile material. He collected fruiting material that warranted classification into a new species. Description. Colima fir is an evergreen coniferous species of tree that will grow to a mature height of 50 to 100 feet (15 - 30 m) tall with a trunk 3 feet (1 m) in diameter at breast height. The crown is conic, becoming columnar with a rounded conic apex. Bark is smooth and silvery-gray at first, later becoming fissured into gray or gray-brown scaly plates. Branches grow ascending at the top of the tree, spreading in the middle crown and reclinate in the lower crown. Leaves on coning shoots are mainly parted below the shoot although with some pointing straight down, curving outwards, then normally twisted to point slightly forward. Needle length is 0.5 to 1.4 inches (1.2 - 3.5 cm) long by 0.06 inch (1.5 mm) broad at the base. Seed cones are ovoid-oblong or barrel-shaped, blunt at the apex, 5.5 inches long by 3 inches (7.5 cm) wide. Seed is 0.5 inch (1.3 - 1.4 cm) long by 0.2 inch (40 - 50 mm) wide, broadest at the middle. Distribution. This species in only known for certain from the Nevada de Colima where it is recorded from the north and northeast flanks of the mountain at elevations between 7,500 and 10,000 feet (2,350 - 3,150 m) above sea level. 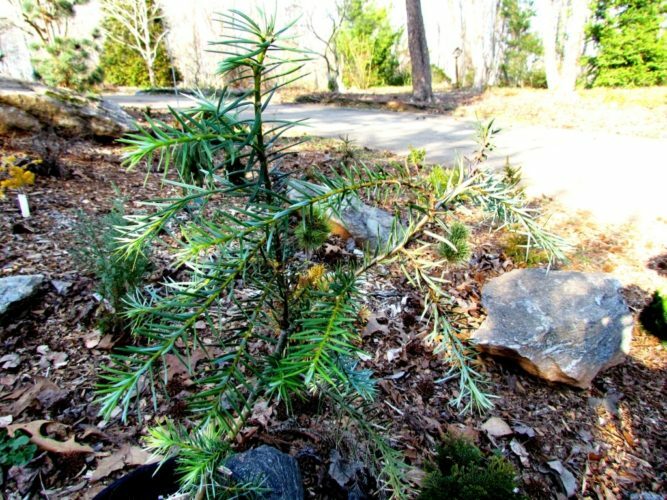 Abies colimensis — a young specimen at the Cox Arboretum, Canton, GA.